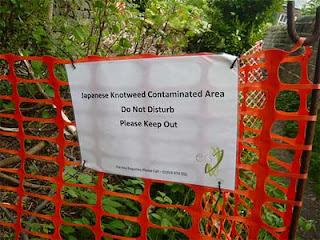 Japanese Knotweed is not native to Great Britain. It was introduced in the 19th Century as an ornamental plant. Despite its good looks, you don’t want to have this thug in your garden – it out grows most other garden plants and will quickly take over your patch. 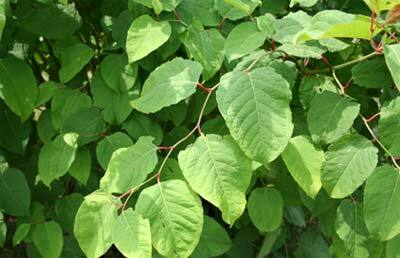 Lush green in colour, Japanese Knotweed has shovel shaped leaves and looks similar to bamboo. Pretty white flowers appear in September and October. If you stand still long enough you can almost watch it grow, hence its reputation as a thug. It can grow up to a staggering 10cm each day! Japanese Knotweed is so tough it can grow through concrete and tarmac! If you cause Japanese Knotweed to spread you are guilty of an offence under the Wildlife and Countryside Act, 1981. Non-chemical controls - Digging out is possible, but due to the depth that the rhizomes can penetrate, regrowth usually occurs. 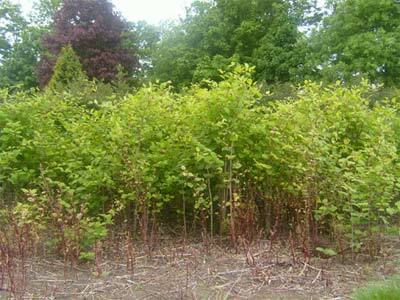 This method also creates problems over disposal as Japanese Knotweed is classed as 'controlled waste' under the Environmental Protection Act 1990. This requires disposal at licensed landfill sites. Alternatively, it can be destroyed on site by allowing it to dry out before burning. On no account should it be included with normal household waste. If digging out is attempted, remove as much root as possible, then repeatedly destroy regrowth. In this way the energy reserves in the remaining underground parts will be gradually exhausted; a process which may, however, take several seasons. Chemical controls – Glyphosate can be applied to the foliage and is passed within the plant to the underground parts. It is useful to cut away old stems during the previous winter to allow good access. The best time for spraying with glyphosate is at the flowering stage in late summer. However, it is difficult to spray at this stage, when the weed is 2.1m (7ft) or more high. A more practical approach is to allow Japanese Knotweed to grow to about 90cm (3ft), which will usually be reached in May, and spray then. There will be regrowth and consequently a second application in mid-summer is useful. Check during September and if it has grown once more, spray again before growth begins to die down in the autumn. Check again the following spring. Avoid spray coming into contact with garden plants. It usually takes at least three to four seasons to eradicate Japanese Knotweed using glyphosate. Professional contractors, however, will have access to more powerful weedkillers that may reduce this period by half. You can actually eat Japanese Knotweed and is sought after by foragers. It tastes similar to gooseberry and rhubarb and young shoots can be stewed down with a little sugar and water, passed through a fine sieve and served with greek yogurt or as a fool. It can be used in savoury sauces too, to cut through oily fish or rich game. 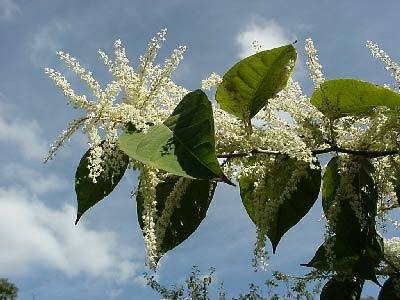 You need to make 100% sure that any Japanese Knotweed you are considering harvesting has not been treated with any chemicals. Fingers crossed this mighty weed never sets foot in your own gardens. Good general advice, your best bet is to get Japanese Knotweed sorted as soon as you can, the more it grows and spreads the harder it will be to deal with.